Elevated between 4593 ft and 9423 ft, the Ski Resort is among the 10 highest elevated Ski Resorts in Grisons. The vertical drop from summit to base is 4829 ft. The average difference in altitude between base and summit of Ski Resorts in Switzerland is 2890 ft. Most runs are therefore relatively long. The day pass at Samnaun is €50.50 making it one of the 5 cheapest ski Resorts in Switzerland. 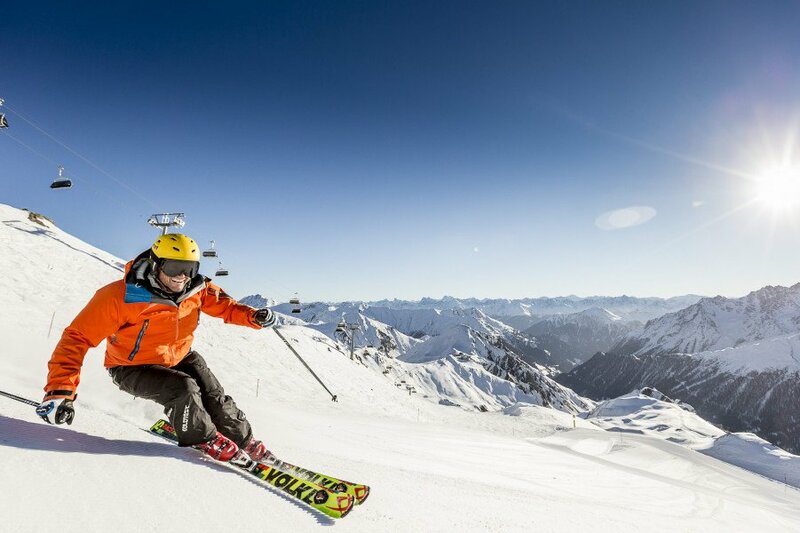 Samnaun is among the 3 best rated Ski Resorts in Switzerland. 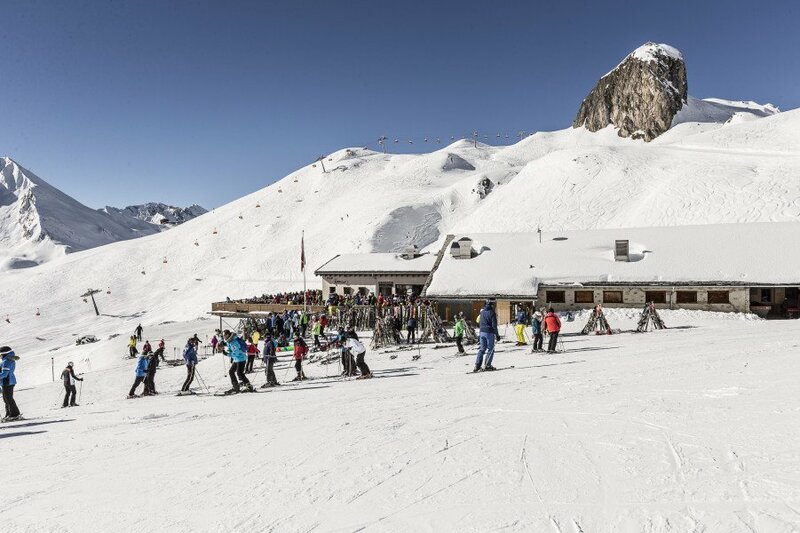 It is among the 10 most family-friendly ski Resorts in Grisons. Season starts on Nov 22 and ends on May 1 (160 days). Average season duration in Switzerland is 112 days. Average snow depth during the season (Nov 22 to May 1) is 44 " at summit elevation and 19 " at base elevation. Snow coverage is usually best during March, offering an average snow depth of 57 " at summit elevation and 25 " at the base. Therefore Samnaun is among the 10 ski Resorts with best snow conditions in Switzerland. 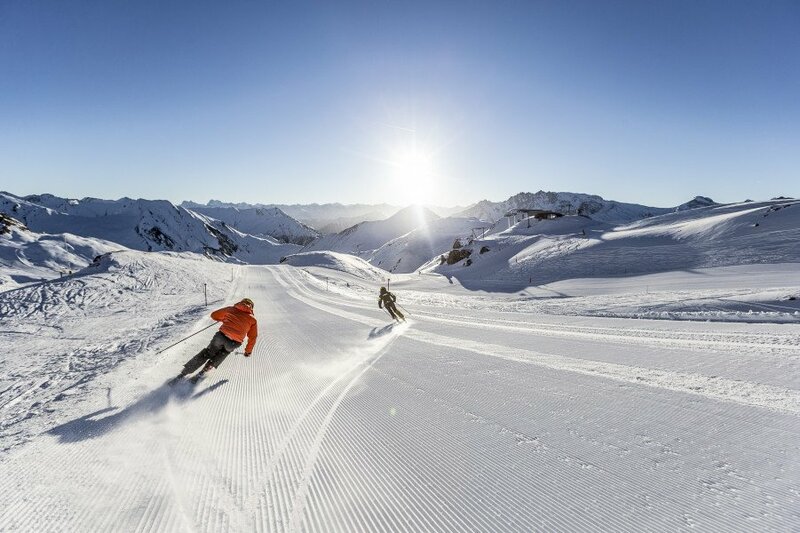 Samnaun features 71 sunny days on average per season. The average for all ski Resorts in Switzerland is 69 sunny days. April is the sunniest month with an average of 23 sunny days. Offering 140 miles of slopes and terrain, Samnaun is among the 10 largest Ski Resorts in Switzerland. The Swiss community of Samnaun lies directly at the border to Austria. Together with the neighboring Ischgl these two areas form Silvretta Arena. With 238 kilometers of slopes (147.8 miles), right between the Alp Trida point and the Idalp area, it is an exciting and diverse ski area. 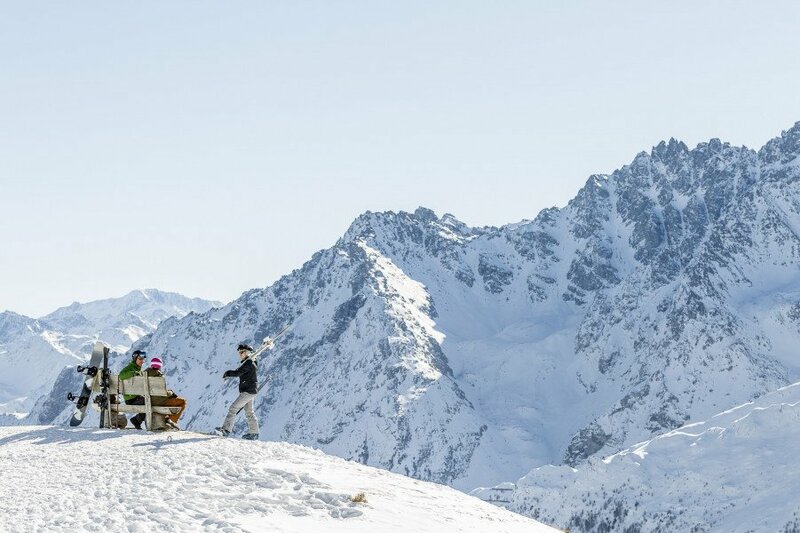 While Ischgl is famous for its Après Ski program, Samnaun convinces with a more family-friendly and cosy atmosphere. The little skiing newcomers should try Musellahang in the Samnaun Valley to have a go at some first attempts on two or one board. They can also have some fun at the Kinderland WinterBlumenTraum. Three magic carpet lifts and a nice obstacle course make those practice sessions easy and entertaining. If they need a break from skiing there is a heated play area called “Magic World”. The parents can meanwhile enjoy themselves on the 400 meter (437.4 yd) long red marked piste. Everyone else can go from the small Samnaun-Ravaisch village to the Alp Trida Eck top station. You will get there by taking the world's first double decker gondola. You will find a wide selection of blue marked runs here, so this area is especially popular with beginners. If you're done discovering this terrain you can always move on to the Austrian side. Near the Idalp there are many other easier runs perfectly suited for less experienced skiers. Sportive skiers can go from the Alp Tider Sattel top station to the Alp Trida. The red marked runs are perfect for carving! An alternative could be the slopes around the Idjoch or Greitspitze area in the Austrian part of the Silvretta Arena. You will find a lot of intermediate terrain here. Popular runs can be found, for example, at the Gampenbahn chair lift (No. 38 and 39) or try the scenic run through the Velilltal (No. 7). Another highlight is the eleven kilometer (6.8 mi) long descent into the center of Ischgl. For professionals it's recommended to go visit the Austrian side of the ski area. Near the Greitspitze and the Palinkopf station there are numerous blacks, which are exciting and challenging even for the best of skiers. To get back to the valley in Samnaun you can either take a slope from Alp Trida or the eight kilometer (5 mi) run from Palinkopf. The latter impresses with a great difference in altitude of 740 meters (2427.8 ft) down to the valley. Silvretta Arena provides 14 huts for a quick break, a longer snack or a nice large lunch. At the panoramic restaurant Sattel, visitors can chose between international and regional cuisine while enjoying a fantastic view from the large terrace. The mountain restaurant Alp Bella is famous for its delicious grilled chicken, which is served in a pleasant homelike stone cabin. Italian cuisine such as pizza and pasta is available at the restaurant Schwarzwand. One of the more modern restaurants is Salaas with its display kitchen. On the menu you will find steak specialties and fondue as well as raclette. In addition, there is a self-serve section. One of the highlights of the ski resort is the black run no.14 a, which is the steepest slope in the entire arena with a gradient of 70 %. From the highest point of the ski area at 2,872 meters (9,422.5 ft) skiers can enjoy a run which is eleven kilometers (6.8 mi) long and leads all the way back to the valley of Ischgl. © Andrea Badrutt, Chur In Samnaun you can shop duty free! 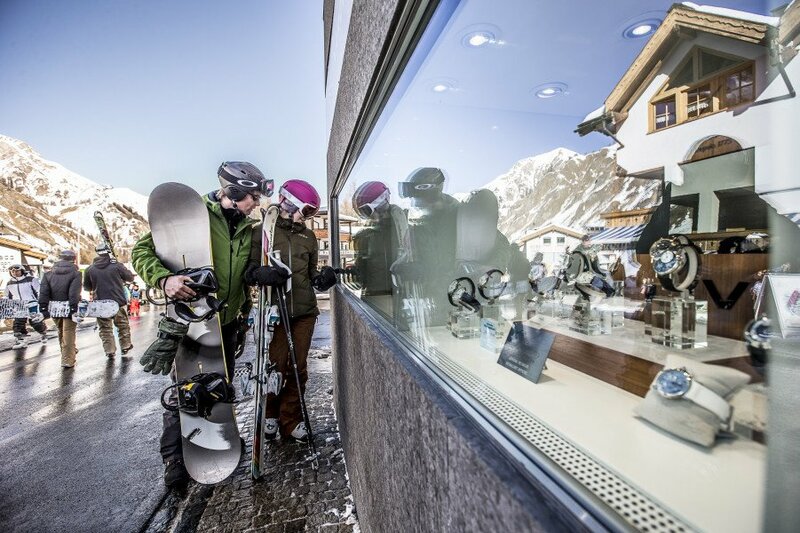 The unique thing about the ski resort in Samnaun is the wonderful possibility to go shopping after a long day on the slopes. Samnaun is the only duty-free area in Switzerland and provides the highest located shopping street in Europe. About 60 stores invite you to a very special shopping experience. The Swiss mountain landscape cannot only be admired while skiing, but also during a nice winter hike. Visitors can chose from 250 kilometers (155 mi) of groomed paths. If you're up for a go on the sledge, there is a toboggan track at the forest cabin Motta Saltuorn. The starting point is only accessible by foot and lies about an hour from the parking spot Votlas in Samnaun Village. Hiking through the beautiful forest, you will be rewarded with breathtaking views over the Samnaun valley. The Alpenquell swimming pool is also worth a visit with an exciting adventure pool and relaxing sauna facilities. 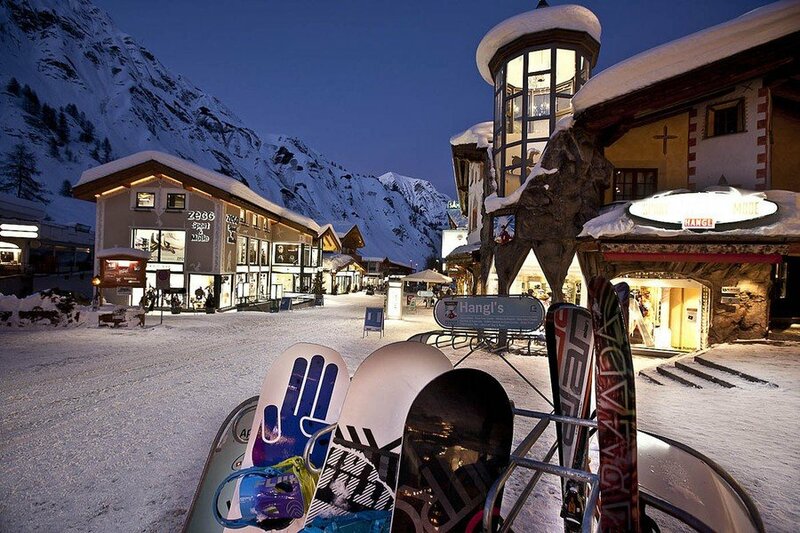 In comparison to the party hotspot Ischgl, Samnaun is known to be a quieter alternative on your winter holiday. But don't worry, you can put a great end to your ski day here as well. On the mountain there are numerous umbrella bars and mountain restaurants to visit and grab a nice cool drink before heading into town. Great spots include El Rico or WHY NOT. While El Rico is closer to a large, heated umbrella bar in pirate style decorations, WHY NOT is a club where a DJ gets the party started. 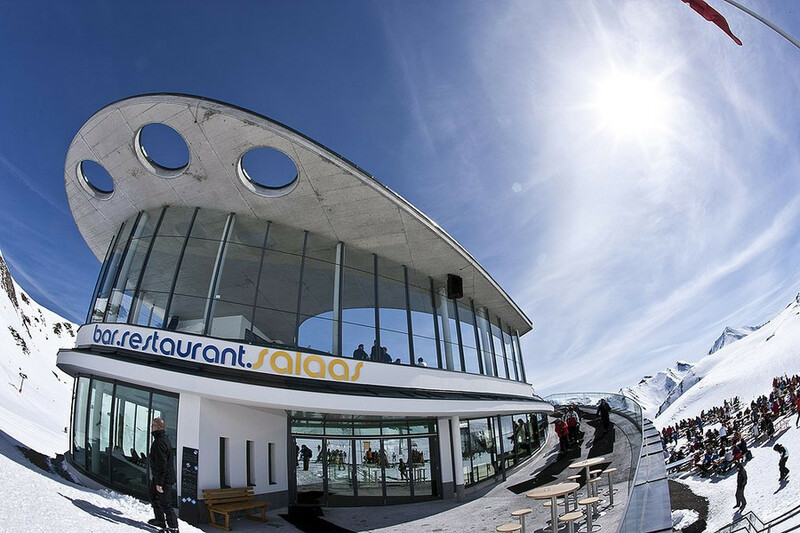 The “Gourmet Stübli”(restaurant) La Miranda in Samnaun Village has already been awarded a Michelin Star and 15 Gault Millau Points for its excellent cuisine. Food lovers can chose between locally sourced beef, calf and lamb as well as truffles from around Alba and lobsters from the region of Brittany. Wine enthusiasts will be best tended to at the Homann's Restaurant. The restaurant has been awarded two Michelin Stars, 18 Gault Millau points and it is famous for its large selection of delicious wines. At the four star restaurant Pröstli visitors can chose between national and international specialties. On the menu of the Bündner Stube you will find regional dishes with recipes dating back to the 17th century. You can reach Samnaun either through Austria or Switzerland. In Austria, take the motorway Inntalautobahn (A12) via Innsbruck to Landeck. Once you've reached the community of Fließ, drive onto B180 and just behind the border turn right and follow the road all the way to Samnaun. From Switzerland, drive until Vereina near Klosters. Use the car transport and then continue to drive until you pass the community of Scuol. Shortly before reaching the border to Austria turn in the direction of the village of Samnaun. Train travelers can either get off at the station Landeck in Austria or Scuol in Switzerland. From there you can take a shuttle to Samnaun. It's best to book tickets to Innsbruck (71.5 mi), Friedrichshafen (124 mi) or Zürich (140 mi).